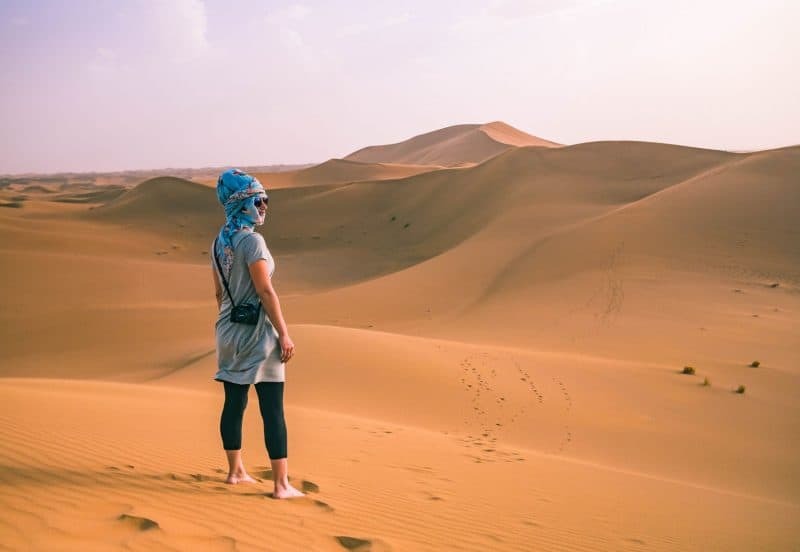 Not only will you find stunning mountain ranges full of cascading waterfalls, but you are also on the cusp of the world-renowned Sahara Desert. The towns and cities thrive with life, from busy markets to ancient ruins, you’ll never tire of this slice of North Africa. Taking a road trip around Morocco has been one of the most phenomenal things I’ve ever done in my travels. The wind in my hair, the scent of verdant flora or the whisp of the desert sand in my nose, the occasional camel traffic, and the varying landscapes going from snow-capped mountains to dusty deserts will forever be ingrained in my mind. Hustle and bustle, chaotic markets, plush riads, views of the Atlas mountains, deserts just outside the main city… Marrakech has a lot going on! While you should certainly get lost in the medina, if you decide to take a break, there’s a ton of adventure just outside your door. 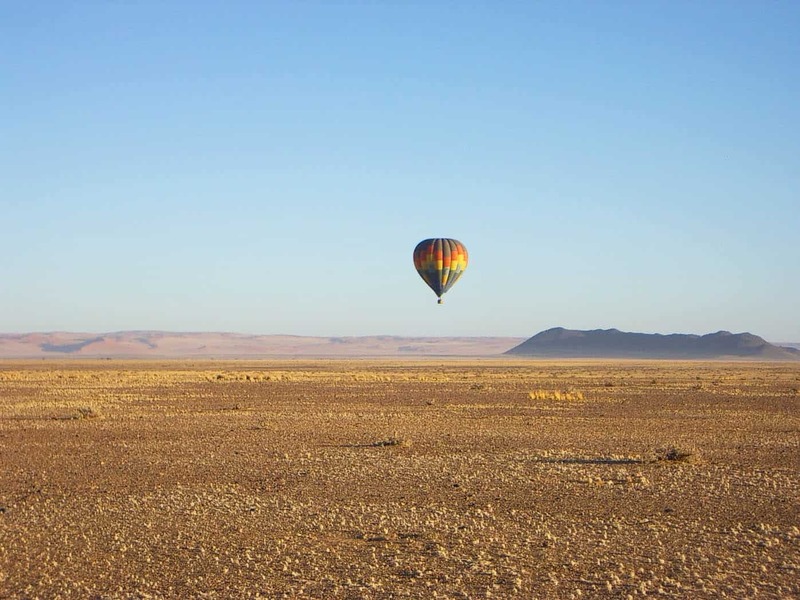 For a birds-eye view of a truly diverse country, a Morocco Tour in a hot air balloon is one that you will not be forgetting in a hurry. The trip will take you high in the sky above the legendary Atlas Mountains at sunrise. When your feet are firmly back on solid ground, you will be treated to a freshly prepared Berber breakfast before taking a camel ride through the desert. A tour in Morocco would not be complete without a trip to the Agafay desert, home to the stunning Atlas Mountain range. You will spend your day exploring the rocky terrain away from the busy city life of Marrakech. After visiting the impressive Takerkouste Lake and dam, you will visit some of the desert’s small villages and learn more about some of the traditions of Berber life. If there is one thing that Marrakech is known for, it is its incredible culinary scene. One of the best ways to fully explore this is literally getting a taste of Marrakech in an in-depth food tour. Through the heart of the city, where you can wander through the souks sampling some of the delicious delicacies on offer, such as olives, pastries, and dried fruits. Once you have tantalized your taste buds with all the unique spices on offer, you can sit down to a delicious dinner at Djemaa El Fna. The Majorelle Garden offers something a little different from a normal Morocco tour. What are you guys staring at? Start your day with a calming walk along manicured paths of Majorelle Park before learning to ride a camel at the Palmeraie. This tour in Morocco can be taken in both the morning and afternoon, and it’s not far outside of Marrakech, so it’s great if you have a busy or tight schedule. No trip to Morocco would be complete without stepping foot in the legendary Atlas Mountains. 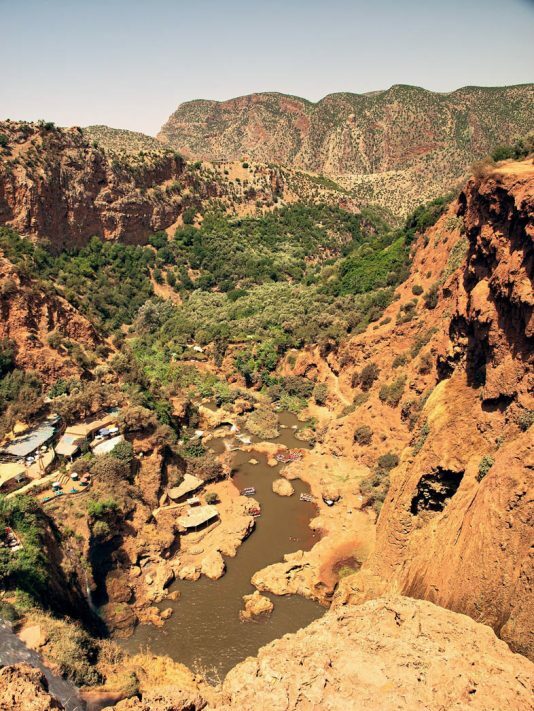 There are 4 distinct valleys that make the region famous, Ourika, Asni, Sidi Fares, and Oukaimeden, and you will get the chance to visit them all on this tour of Morocco. One of the most memorable parts is sure to be witnessing the breath-taking Mount Toubkal, the highest peak in North Africa. An expert guide will be with you every step of the way, ready to show you the incredible waterfalls and traditional Moroccan life. 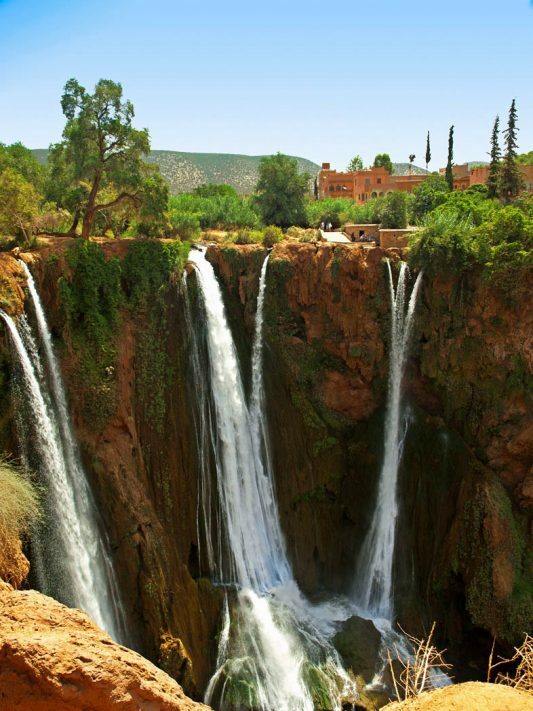 Visit one of the most impressive sights in the Atlas Mountains, the 110-meter waterfalls of Ouzoud Falls, the highest in North Africa. Make memories that will last a lifetime as you depart from Marrakech and wander through the olive trees to some of the best viewing spots of the falls. For some incredible photo opportunities make the most of this Morrocco tour from Marrakech to the stunning Ourika Valley, located in the Atlas Mountains. A real highlight of the tour is visiting the 7 waterfalls of Setti Fatma and the incredible landscapes of the valley. Ancient history mingling with 21st-century films and shows… That’s what Ouarzazate has going on. This little desert town packs a lot and is held in high regard for its famous structures and sets. If you have always wanted to see the majestic desert and some movie sets, then this tour in Morocco is for you. You will wind your way through the stunning landscape of the Atlas Mountains before reaching the UNESCO World Heritage Site, the fortified Kasbah of Ait Ben Haddou. Test your camel riding skills as you travel like royalty across the desert and marvel at the many lush oases and other kasbahs on the way. Merzouga is the famous and favorite desert destination in the country. However for those a bit more intrepid, with a bit more time, and wanting something more off the beaten path, keep reading for a second desert excursion option. 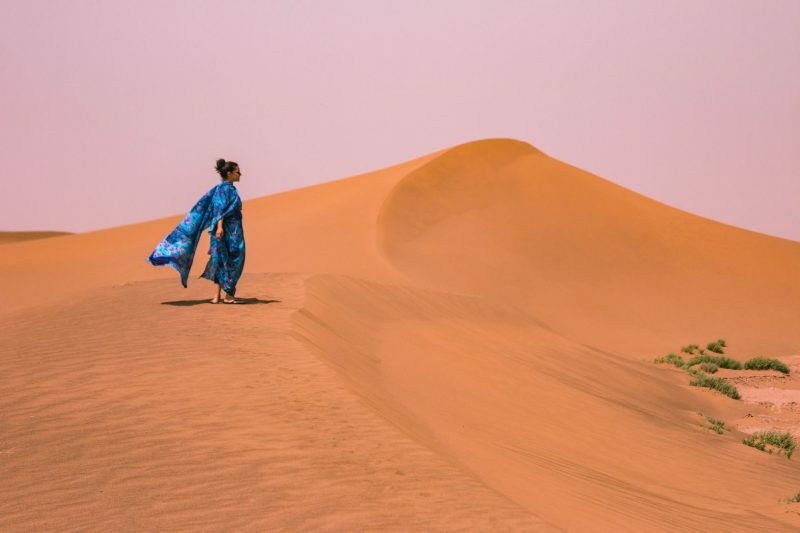 Wearing a traditional Melhafa on some sand dunes! One of the best tours of Morocco is taking a three-day adventure from Marrakech to Merzouga across the Sahara Desert. 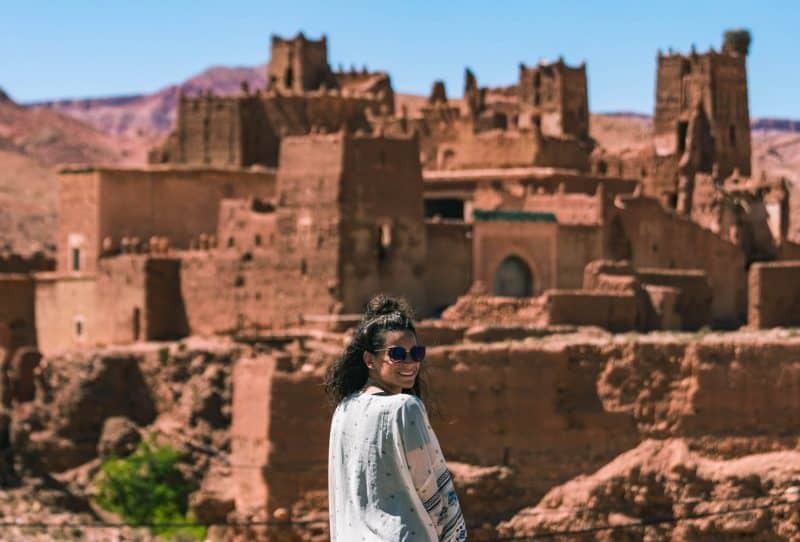 On your journey you will be able to witness the impressive Atlas Mountains, enjoy the sunrise and sunset camel rides, stay overnight in a classic Berber tent, take guided tours of both the Tinghir oasis and Todra gorges and visit Ait Ben Haddou with a guide to name just a few of the activities. Another fantastic option is spending the night deep in the heart of the Sahara Desert in a location that you have traveled to by camel. Picture dining around a campfire to the music of drums before sleeping under a canopy of stars. An incredible addition while in Merzouga is to add a 4×4 Morocco tour—one of the best ways to take in the desert scenery. On your trip, you will visit the village of Khamlia, play traditional instruments and experience local culture by visiting a Berber family in their home for lunch. 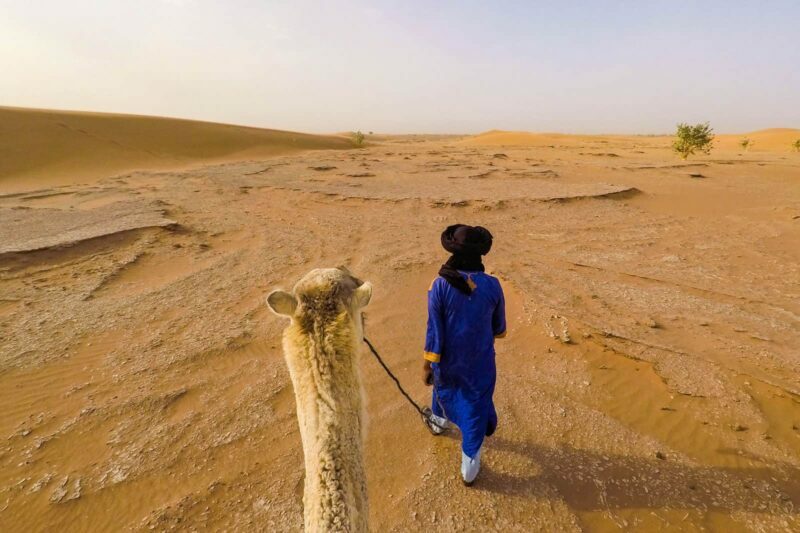 Start your journey at Fes before embarking on a 2-day small group tour of the Sahara Desert. 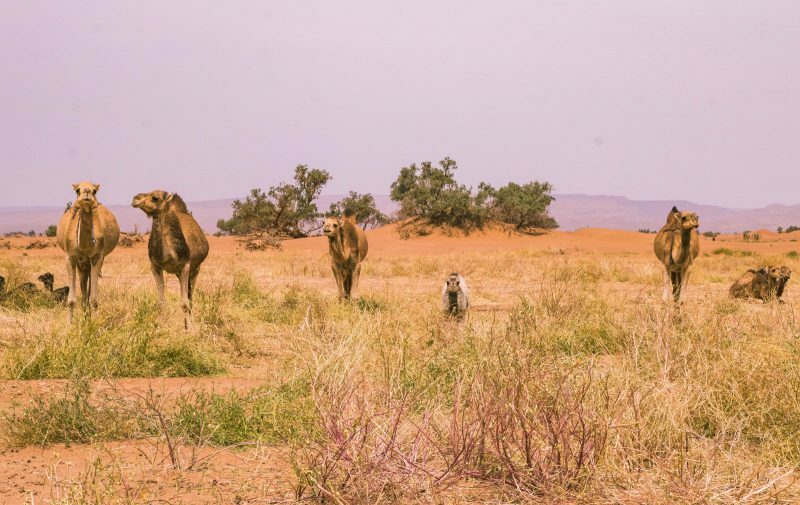 On this Morocco tour, you will truly get a sense of the African wilderness as you spend the night at an authentic Berber camp and ride a camel across the dunes. Other highlights of the trip include driving through a cedar forest to see the resident monkeys and watching the sunrise of the dunes in one of the most unique places in the world. While Merzouga may be the popular desert spot, it’s certainly not the only one. M’hamid, a bit more south, is another entrance to the Sahara and one that is far wilder than its sister. The Erg Chebbi sand dunes in Merzouga are a bit bigger but Erg Chigaga outside of M’hamid takes more effort, features far fewer crowds, and is still a stunner. 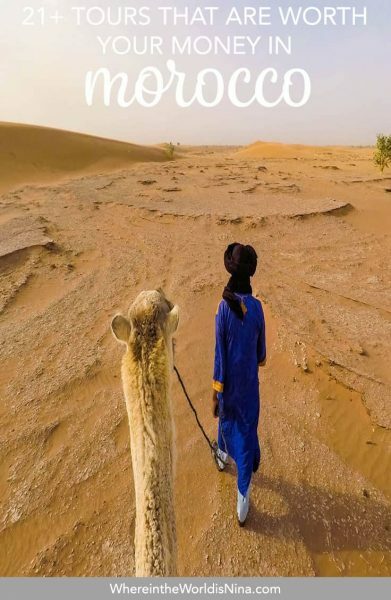 Many of the activities are the same in terms of Berber drum circles, camel rides, exploring the sand dunes, stargazing etc… but the experience is a lot more quaint and personal as it’s not as commercialized as Merzouga and because of the effort it takes to get there, there’s more of sense of adventure being truly in the wild. If you thought Morocco was all desert, let Imlil show you the other side of the country. 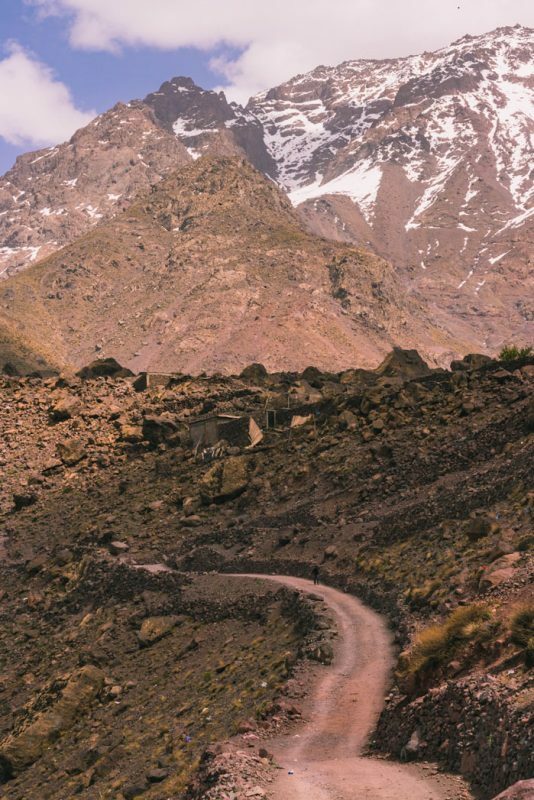 Nestled high in the mountains, you’ll be shocked to see snow-capped mountains and people donning crampons tackling the bold Mount Toubkal and its surrounding peaks. 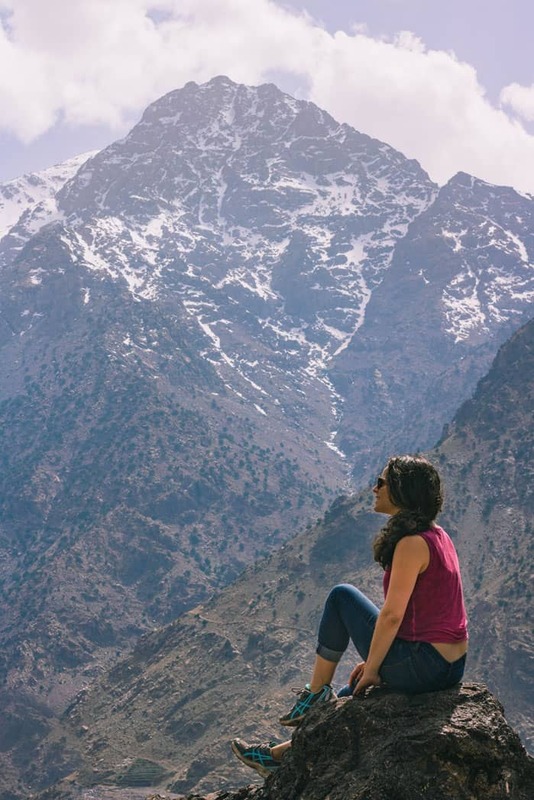 Once you reach the top, you will be rewarded with once in a lifetime views of the Atlas Mountains and Toubkal National Park for a memory that will last a lifetime. Fes is damn fascinating. The labyrinth of a medina, the hilltop views, the mecca for markets, and the sheer chaos is enthralling, to say the least. Get lost (you have no choice) and then check out the surrounding points of interest. Although your day may be packed, seeing some of the cultural wonders of Morocco is a chance you should not pass in a hurry. Get transported to some of the most impressive sights in the country such as the Roman ruins of Volubilis, the historic Medina of Meknes, one of Morocco’s holiest cities, Moulay Idriss and the striking gates of one of Morocco’s imperial cities. When you think of Morocco, one of the first things that come to mind is the bustling markets, filled with the sounds and scents of daily life. This Morocco tour will take you to some of the very best souks in the town of Fes, including the famous tanneries, the Spice and Perfume Souk, Gold Soul, Henna Souk and various others. It will feel like you are stepping into a world that time forgot as you are surrounded by a myriad of color and life. You could also pick up a souvenir on this tour in Morocco like a new leather item or one of the gorgeous lamps you’ll see everywhere. When staying in the city of Fes, a trip would not be complete without checking out some of the city’s most impressive architectural feats. As the oldest of Morocco’s imperial cities, there are plenty of buildings that are worth a look, and on this Morocco tour, you will be taken to some of the most celebrated mosques, madrasas, and palaces with a knowledgeable guide with you along the way. Seeing gorgeous buildings is one thing, understanding the significance, the purpose, the history, and story surrounding it makes the experience totally different. A bit of a touristy coastal town, Agadir still holds some merit, at the least with its day trips. Oases to kasbahs, Agadir is a great hub for exploring deeper into Morocco. Take a Morocco tour to the walled city of Taroudant and find the hidden treasures that are just waiting to be uncovered. 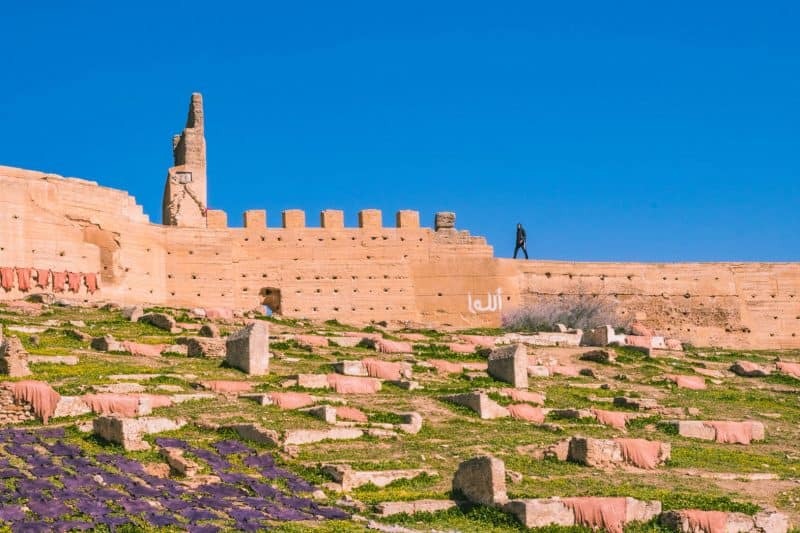 Walk the ramparts and explore the craft bazaar before continuing your journey to the ruins of an ancient Kasbah, with views over the village of Tiout, the Souss Valley and High Atlas Mountains. Get immersed into the Berber culture on this fun-filled Arabian night in Agadir. Allow yourself to be enchanted by a show filled with music, dance, and magic before enjoying some of the country’s culinary delights. This is a Morocco tour that shows you a bit of culture you would otherwise not get to experience. Picture steep-sided canyons, lush vegetation, and spectacular rock formations, all of which can be seen on the Paradise Valley Morocco tour from Agadir. This trip offers the perfect way to escape the hustle and bustle of the city and be at one with nature. Trek through the wild forests and cool off with a dip in some of the rock pools before tucking into a well-deserved Berber lunch. Just note that Paradise Valley is best visited after there has been some rain as the pools can get dried up. Beachy laid-back vibes for days in Essaouira, add to is a happening little medina, fab coastal cuisine, and even a few movie sets and you have one insanely beautiful and cool town. Take a tour of Morocco that departs from Marrakech to Essaouira, and enjoy a 2-hour surf lesson, as well as a visit to the local fishing harbor and medina. 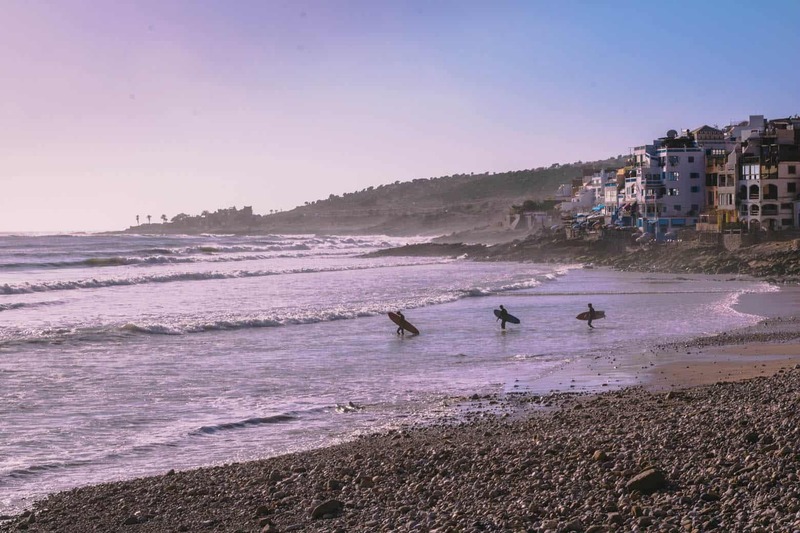 Departing from Essaouira, this tour of Morocco will certainly get your blood pumping. No matter your skill level, you can feel the wind in your hair on this 3-hour quad bike excursion over the nearby dunes to some natural caves. The more experienced drivers will have the option of extending their Morocco tour towards the beach of Taguenza. 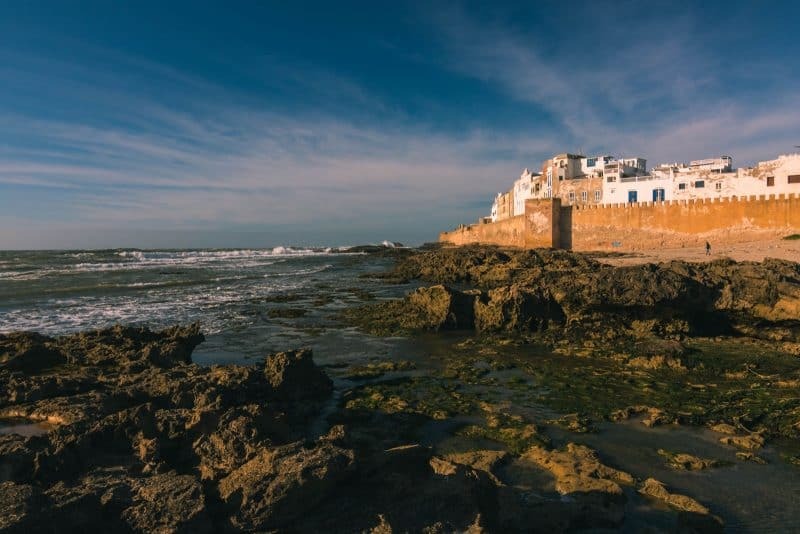 This Morocco tour will allow you to fully explore the county’s culture, agriculture, and architecture, as you travel from Marrakech to the historic port city of Essaouira. As well as getting to know the ins and outs of the town, you will also visit an Argan oil cooperative to see how the oil is extracted, and take in the splendor of its UNESCO-listed historic center. Spend the day wandering through the vivid lane and market squares of Chefchaouen with plenty of free time to watch the local life. The Morocco tour, starting at Fes, also includes the chance to marvel at the Rif Mountains and enjoy a panoramic view of the city on your way down. Thanks to the city’s recognizable blue hue, there will be photo opportunities around every corner. Explore the old medina and the souk, or shop for Moroccan products and souvenirs at bargain prices. 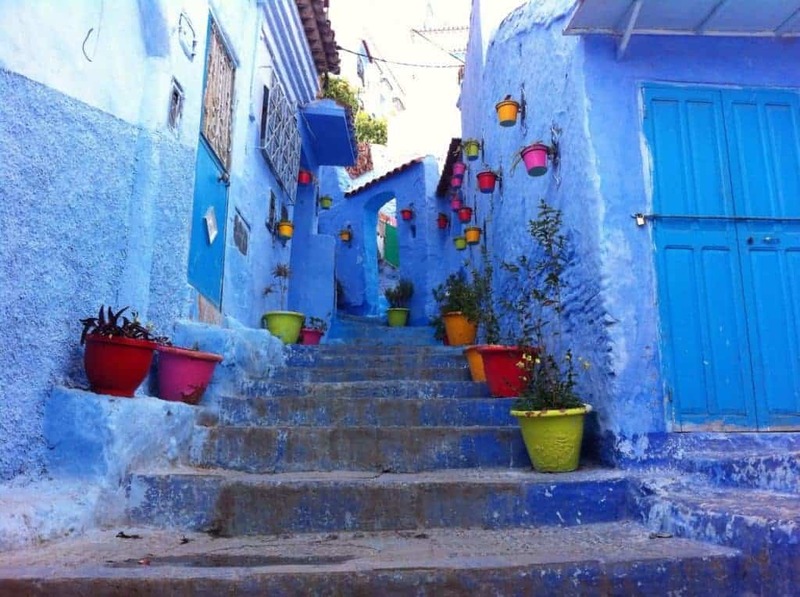 Alternatively, there is the option to start your tour of Chefchaouen from Tangier. Anyone up for a group tour? It’s understandable if you’re either not at all a travel planner or perhaps solo wanting to meet people to travel with. A group tour in Morocco could be the perfect solution to your conundrum, oh, and a totally epic one at that! Group tours are actually incredibly fun and you’ll surely find your “tribe” while on the trip. Here is some motivation if you’re not sure if a group tour is right for you. If you are already loving the sound of this, I’ve selected some amazing group tours to choose from. 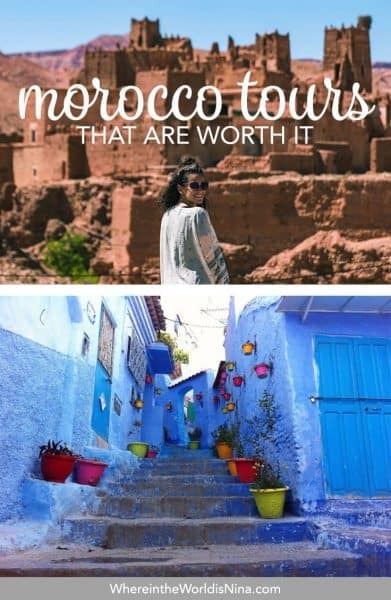 These types of tours offer a fantastic way to explore the country of Morocco, taking in all the sights, smells and culture that the unique country has to offer, you just need to show up. New friends, new surf buddies. To see some of Morocco’s best bits, an 8-day tour from Casablanca to Marrakech will allow you to tick off three of the country’s most impressive towns, Casablanca, Fes, and Marrakech. For a truly unforgettable experience, you can head deep into the legendary Sahara Desert and then to the windy and rugged coast. Get lost in the winding souks, ride a camel over the dunes at sunset, stay at a desert camp, and then try your hand at surfing—all with your new mates. If you have a little longer, then the 13-day Moroccan trip will allow you to see more of what Morocco has to offer. You will really feel the magic of the Middle East as you travel from Marrakech to Casablanca, Fes, the Atlas Mountains and a range of other destinations, with even an overnight stay in the Sahara Desert! There are plenty more options for exploring Morocco with a group tour. One thing is certain, your journey through Morocco with your new friends will be one of those life-changing experiences. Guaranteed. So which of these tours in Morocco are you most excited for? When are you going? Let us know in the comments!